Food canning process is one way of saving money. But before starting with the canning or the preserving process, be able to know the ingredients that you will use. These days, contaminated foods are in the news with vegetable and meat products being recalled by certain manufacturers for some reasons. Canned food consumers are not fully aware of the chemicals or pesticides used in growing veggies and manufacturing foods we buy in supermarkets. Furthermore, we do not exactly know where or how the foods were processed. This makes every consumers become concerned about the products which are brought home to be consumed by the family. Food canning process can include vegetables and fruits which you have grown in your own garden or have purchased from organic or regular farmer’s market wherein you can ask the farmer himself about the way he raised his produce will help to guarantee the safety of determining the foods you feed your family. It also gives the feeling of being ‘in control’ of the decisions you do for your loved ones. Provided with the right and enough information, food canning process will be a very easy and valuable practice which will become a big part of your routine. You can begin with the process now towards an economical and healthy living. There are different ways to can foods. Here are some of them. Pressure canning is a method used with low-acid foods wherein vegetables fall into except for tomatoes which is already considered as a fruit. This technique requires a 240 degrees Fahrenheit temperature in order to destroy certain amount of bacteria. Water bath canning is a technique in food canning process including jams, jellies, fruits, pickles, preserves, tomatoes and relishes. All of them fall under the high-acid foods which must be processed in boiling water at 212 degrees Fahrenheit so as to exterminate bacteria. The processing time can vary depending on the jar and food size. Drying is an old and efficient technique in canning or preserving meats, veggies and fruits. It became popular because of its simplicity and its capability to provide natural and healthy snacks. The best thing about drying is that it takes lesser space for storage than other methods. Freezing is another food canning process that involves like some fruits and fresh vegetables. It involves blanching or quick steaming of foods. After blanching, promptly dip them in cold water in order to stop the action of enzyme. 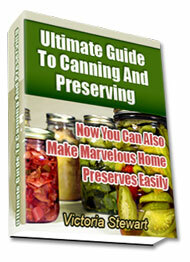 With canning and preserving, tasty and nutritious foods will fill your dining table now. What is best about it is that you can pass on your knowledge in food canning process to your kids, grandchildren and friends to make them obtain that rewarding feeling too. It will make you confident that you have provided them not just with healthy foods but a better life ahead.